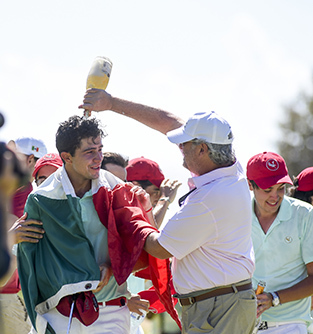 LA ROMANA, Dominican Republic (Jan. 20, 2019) – Mexico’s national team is so close that the man who dumped champagne on Alvaro Ortiz’s head after a winning birdie putt at the Latin America Amateur wasn’t even his own father. It was the father of a teammate, Jorge Villar. It was an aggressive scene on the finishing hole of Casa de Campo’s Teeth of the Dog course as a small army of mint green-shirted teammates rushed Ortiz and nearly drowned him in a prolonged bottled-water bath. Forgive them for the overexcitement. They’ve been waiting years to do this. Ortiz has been waiting patiently, too. Drenched, Ortiz found the arms of his own father, Carlos, for a long embrace. The two have been through a rough patch recently, but the older Ortiz wanted his son to know he had noticed the hard work that had preceded this week. “He just told me that hard work pays off, always, and it was just an emotional feeling,” Ortiz said. In the back of his mind, Ortiz had left open the possibility that next week he would begin chasing a pro career on the PGA Tour Latinoamerica. But to follow this with that would have been tragic. His LAAC record has been too good. He lost in a playoff in 2017 and finished second to Chile’s Joaquin Niemann last year. The most notable carrot on the line at the LAAC is an invitation to the Masters, which Ortiz will gladly accept. He can also play the Amateur Championship and the U.S. Amateur now, as well as bypass U.S. Open local qualifying. They are options that will force Ortiz and his family to sit down and design a plan for the next few months. On Sunday, he didn’t yet know what that could look like. The family has never been to Augusta because they wanted to make the trip on specific terms. Ortiz’s victory came on the strength of a final-round 6-under 66, which ultimately got him to 14 under. In the group ahead of him, LSU senior Luis Gagne, of Costa Rica, matched that final-round score. But Gagne had started the day two shots behind, and a messy bogey at the 17th ultimately ended his run. Still, the day had as much drama as you could hope for, with Gagne reeling off crucial birdies at Nos. 9, 11 and 14. Ortiz appeared to be loosing steam with a bogey at No. 8, but he made par out of a greenside bunker at No. 9 to make the turn just one behind Gagne. Ortiz then stuffed a 3-wood to 15 feet at No. 12, where he made his first eagle of the week. When he followed with birdie at 13, he could breathe somewhat easier. He birdied No. 17 and was already smiling as he marked his eagle putt on No. 18. He only needed a par to win but made one final birdie. An admittedly emotional player, Ortiz has worked to better keep his emotions in check. In past tournaments, particularly past playings of this tournament, showing his temper has cost him. "You know, when you're like in a tournament, like say in Panama (for the 2017 LAAC), I felt I lost the tournament because of my emotions," he said. "I let them have the best of me -- even though I had my chance to win it in the playoff -- but I think I could have closed the deal early on." In any event, when a LAAC win played out in his imagination, Sunday was a lot less stressful. But any way it happened, this was still Ortiz’s week. To be honest, it felt like Mexico’s week from the beginning. Shortly after play began on Thursday, representatives from the Masters, the USGA and the R&A – the tournament’s organizing partners – announced Mayakoba Resort as the 2020 host of this event. It will be the first time Mexico hosts, and it’s only too bad that Ortiz won’t be there to defend. There were nine Mexican players in the field this week, more than any other country. Seven of those players made the cut and three finished in the top 10. If you are only as good as the people around you, then it explains why Ortiz rose to the top this week. Since exhausting his college eligibility at the University of Arkansas last spring – where he led the Razorbacks in scoring during both his junior and senior seasons – Ortiz has lived with his older brother Carlos in Dallas. Carlos is charting a path on the PGA Tour, and on Friday threw out a 62 at the PGA Tour’s Desert Classic. There is a four-hour time difference between La Romana and California, but Carlos jumped the gun and sent a congratulatory text before the start of his final round anyway. It was one of dozens waiting, unread, on Alvaro’s phone. Carlos is a natural role model, and as Alvaro points out, it’s never a bad thing to live and learn from a PGA Tour player. Alvaro wanted to beat his brother into the Masters field, but now that that’s done, he hopes Carlos will get in, too. Regardless, a Mexican flag will fly in Augusta. Past Carlos, Alvaro has a mentor in Justin Poynter, the director of instruction at the Jim McLean Junior Academy. When Alvaro was 14, his parents were looking for a live-in junior academy where he could take his game to the next level. They settled on Poynter’s place, and Poynter even took Alvaro into his own Fort Worth, Texas, home. That was a dream cul de sac, as it turns out. PGA Tour player Jason Day, who was just starting out at the time, lived down the street, and that’s where the ping pong table was. Games sometimes went past midnight. As he starts to wade into the professional world, those relationships will be more crucial than ever. Poynter has already asked Day to help Ortiz get his bearings at Augusta, and to pencil him in for a practice round. When Ortiz joined Poynter’s stable, he was good but not great. Ortiz was one of nine kids working out of the academy that year, and over the course of nine months, Ortiz worked hard to develop his short game in addition to his swing. Winning did not come easily or immediately, but the door opened when Ortiz won his first AJGA event in south Missouri. Poynter has coached enough tour players – even caddied for a few – to know that you need to catch a few breaks. The LAAC represents that for Ortiz, and it couldn't be better deserved. This time he came back smiling. Founded by the Masters Tournament, The R&A and the USGA, the LAAC was established to further develop amateur golf in South America, Central America, Mexico and the Caribbean. 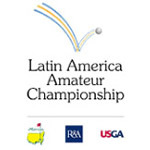 The LAAC is a 72-hole stroke play event open to a field of 108 amateur players in Latin America, chosen by their respective national federations according to their World Amateur Golf Ranking. Past winners of the championship, as well as last year’s top-five finishers, are automatically entered into this year’s championship. The LAAC champion annually receives an invitation to compete in the Masters at Augusta National Golf Club. In addition, the winner and the runner(s)-up are exempt into the final stages of qualifying for The Open and the US Open Championship. The champion is also awarded full exemptions into The Amateur Championship, the US Amateur Championship and any other USGA amateur championship for which he is eligible.